Fall Colors in Door County. Classic scene from northern Wisconsin. A farm nestled in fall colors, surrounded by cornfields on an October day. Where in the United States is Wisconsin? Location map of Wisconsin in the US. Wisconsin is a state in the East North Central Division of the US mainland. It is bordered by Lake Superior and Michigan to the north; by Lake Michigan to the east; by Illinois to the south; and by Iowa and Minnesota to the west. The area of Wisconsin was part of the original territory of the United States, being part of lands ceded by four states to the United States and designated in 1787 as the ‘‘Territory northwest of the River Ohio.’’ Wisconsin Territory was organized on 3rd July 1836, from part of Michigan Territory; it included all of present-day Wisconsin, Iowa, and Minnesota, eastern North Dakota and South Dakota, and a small part of northeastern Nebraska. 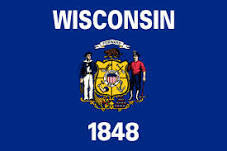 Wisconsin was admitted to the Union on 29th May 1848, as the 30th state, with generally the same boundary as the present state. 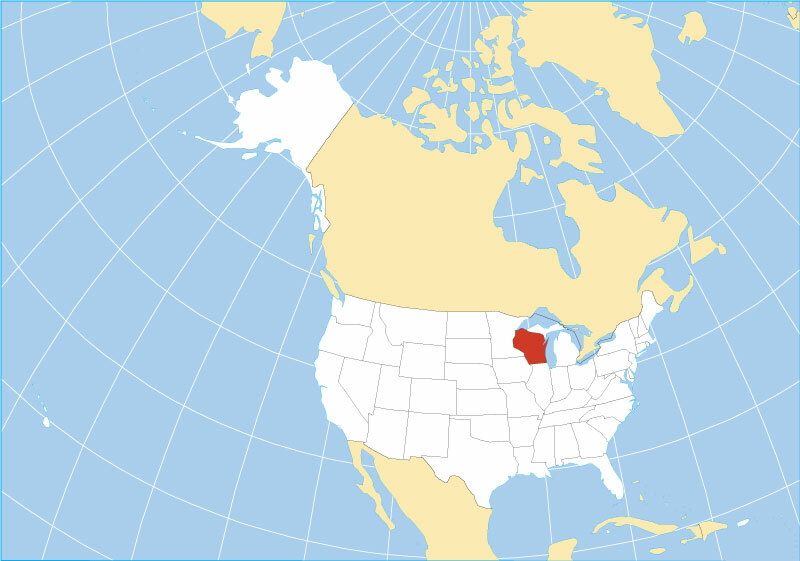 In area Wisconsin ranks 23rd in the US, with a total area of 169,634 km² (65,496 sq mi) , the state is somewhat smaller than half the size of Germany. Compared with other US states, Wisconsin would fit into Texas slightly more than four times. The state is subdivided into 72 counties. 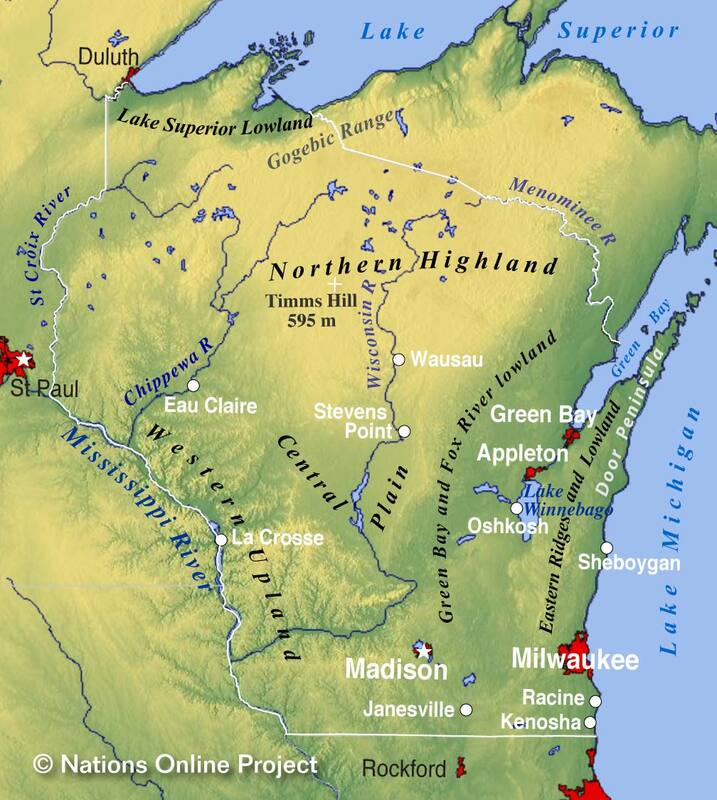 Wisconsin's landscape consists of five main geographical regions. 1. There is the Lake Superior Lowland "up north", the forested coastal plain along the shore of Lake Superior. 2. The plain is bounded by the Northern Highland, an ancient mountain range, flattened out by erosion and glaciation. Timms Hill in Price County is the highest point in Wisconsin, at an elevation of 595 m (1,951 ft). 3. South of the upland is the v-shaped belt of the flat Central Plain covered by hardwood forest and some areas are used for agriculture. Between the plain and the Eastern Ridges and Lowland situated is Lake Winnebago, the largest lake entirely within Wisconsin. 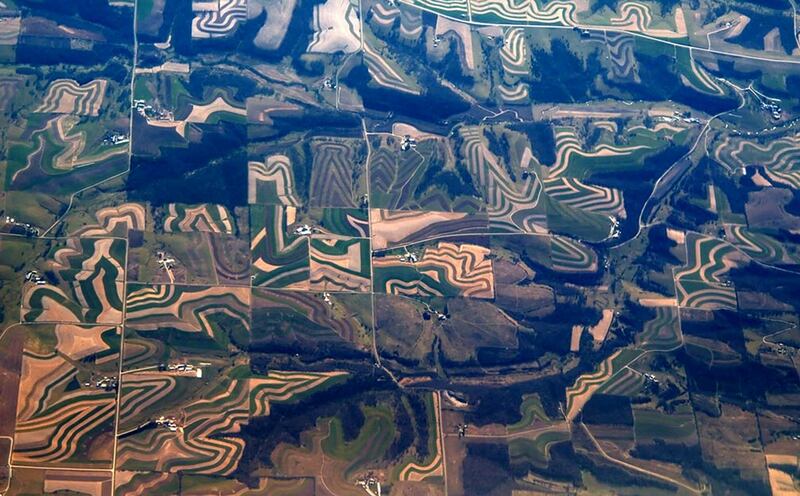 Aerial image of Wisconsin topography. Farmers in the rolling hillside need to follow the contours of their land, so farming in straight rows is both not possible and not good for the soil. 4. To the south west of the plain lies the Western Upland, a rugged, hilly region, dissected by rivers and streams. 5. The Eastern Ridges and Lowlands in south east along Lake Michigan is made up of the Lake Michigan lowland and two cuestas (a ridge with a gentle slope on one side, and a steep slope on the other), the arched Niagara cuesta stretches along the shores of Lake Michigan, further west is the Black River Magnesian cuesta or escarpment, in between those ridges expands the Green Bay-Lake Winnebago-Rock River lowland. Some islands belong to Wisconsin, there are the Apostle Islands group in Lake Superior, and Washington Island in Lake Michigan. 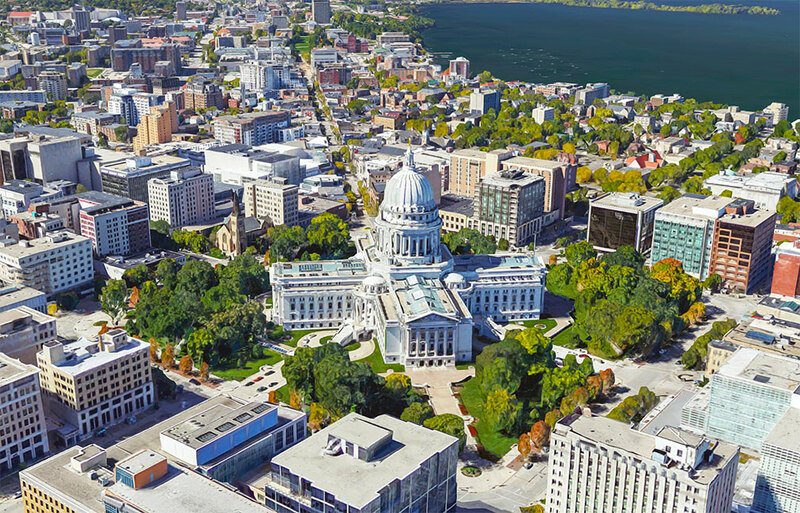 Rendered image of Wisconsin State Capitol, in Madison. The Beaux-Arts style building houses both chambers of Wisconsin's legislature, the Wisconsin Supreme Court and the Office of the Governor. Wisconsin has a population of about 5.8 million people (2018 est.) . 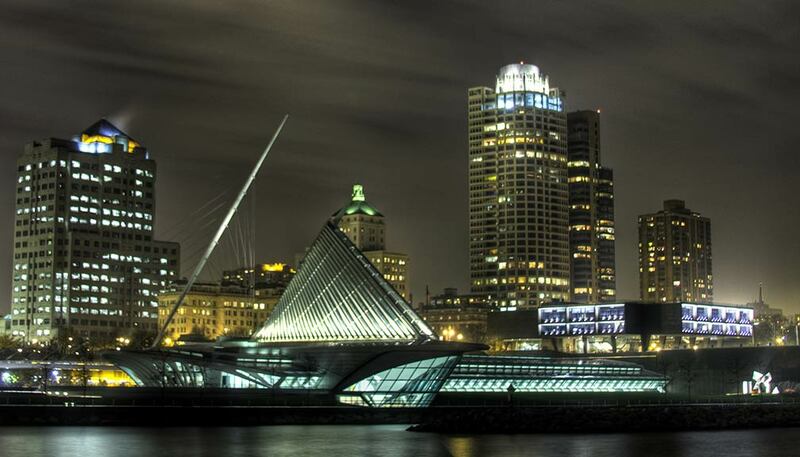 Capital city is Madison, largest city is Milwaukee, the largest metro area is Greater Milwaukee (Metro Milwaukee; pop. 1.6 million). Other major cities are Green Bay, Kenosha, Racine, and Appleton. Antigo, Ashland, Bayfield, Beaver Dam, Beloit, Black River Falls, Brule, Chippewa Falls, Crandon, De Pere, Dodgeville, Eagle River, Eau Claire, Fond du Lac, Fort Atkinson, Hayward, Hurley, Janesville, Kaukauna, Kewaunee, La Crosse, Manitowoc, Marinette, Marshfield, Menomonee Falls, Menomonie, Merrill, Monroe, Oconto, Ojibwa, Oshkosh, Osseo, Park Falls, Pembine, Platteville, Plymouth, Portage, Prairie du Chien, Rhinelander, Rice Lake, Richland Center, Shawano, Sheboygan, Sparta, Spooner, St Croix Falls, Stevens Point, Sturgeon Bay, Superior, Tomah, Tomahawk, Two Rivers, Viroqua, Watertown, Waupun, Wausau, Wauwatosa, West Allis, West Bend, Wisconsin Dells, and Wisconsin Rapids. 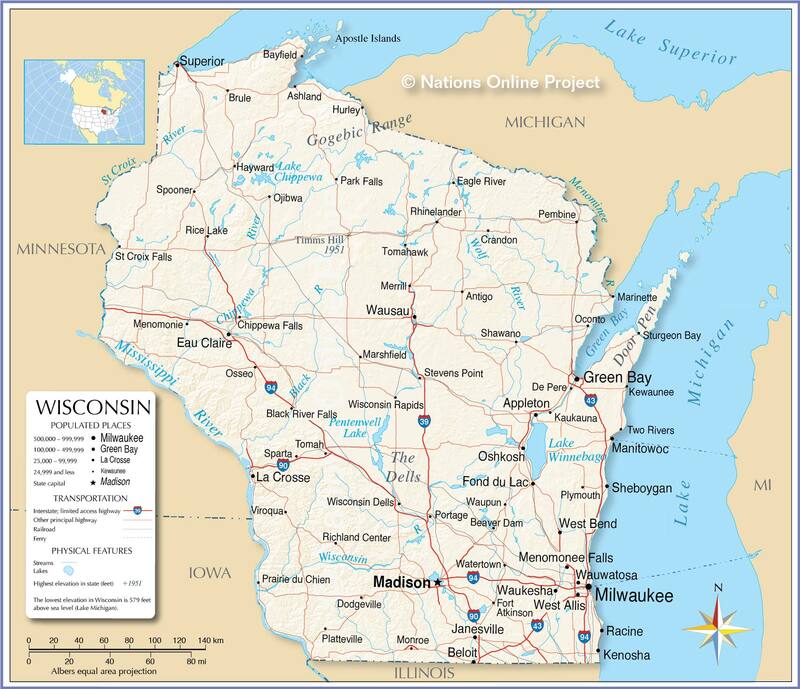 A detailed map showing the US state of Wisconsin with boundaries, the location of the state capital Madison, major cities and populated places, rivers, streams and lakes, interstate highways, principal highways, and railroads.